The dollar store is definitely one of my favourite stores hands down. 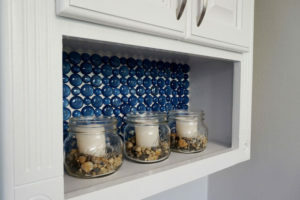 Their are so many Dollar Store Decor Hacks you can try. Why toss hundreds of dollars on items you can get for $1. This is my second dollar store post, check out my other article on Dollar Store Organizing Tricks and hacks. 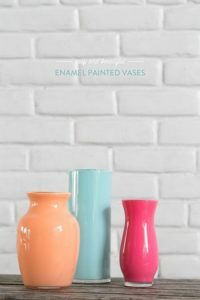 I have complied 11 dollar store decor hacks to spruce up your home on a budget. 1. 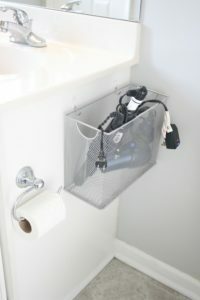 Head to your nearest dollar store and purchase a file box to help organize your home supplies. 2. 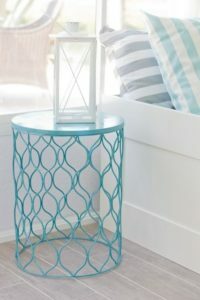 A simple dollar store trash can be turn into a really nice night stand, now that’s a dollar store hack. 3. 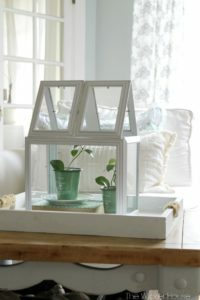 Make an elegant greenhouse out of picture frames. 4. 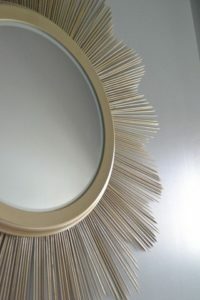 By using an old mirror or whatever you choose you can make a sunburst mirror from bamboo skewers. How innovative! 5. 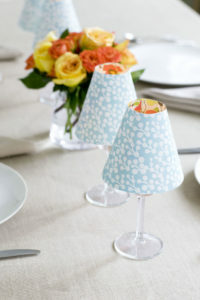 You can make cute wineglass lampshades for decorating your home. So simple and easy to make. 6. All these items you can get at the dollar store. 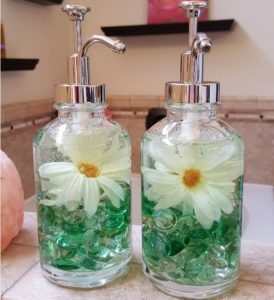 May cost you roughly 7 to 8 dollars to make this cute soap dispenser. 8. I have always seen these glass wafers at the dollar store and had no idea they could be used like this. 9. You can use this cute little tray to decorate your home or to serve to your guest, whatever you choose it’s a cheap. 10. Spruce up your table by using nail-heads. You can buy them in different colours or spray paint them to make your own unique colour. 11. 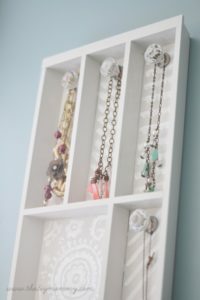 Make a jewelry holder from a cutlery tray. Let me know if you have tried any of the DIY’S above and any other ideas not listed you have tried. I love seeing cheaper ways to decorate and organize on a budget. I used photo frames and candle holders to make a bathroom tray for toothbrushes, makeup brushes, Q tips, etc. I took spray painted the entire frame silver including the glass silver to mimic a mirror. Arrange them in a V shape,and tie a bow around the center one to match decor. These were a huge hit. I was kind of jealous to not have made one for myself! If I could, I’d include the final image of how it turned out! That’s awesome!!!! I would love to see it Lisa. I have been looking for the trashcans featured in idea #2 for a LONG time. I haven’t even been able to find them on the Dollar Tree website. I need HELP!! Unfortunately, I am unable to locate this item myself. Sometimes these items are sold for a limited of time and I believe this trash can was a different colour but then DIYed into turquoise. 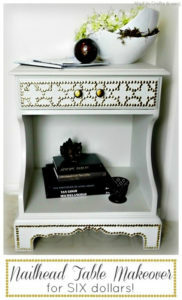 However, you can find similar trash cans online and repurpose it into a nightstand and spray paint it into your colour of choice. 🙂 Thank you for visiting. How do i make the lampshades out of the wine glasses? 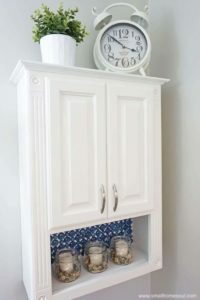 Also would like to see a pic of the picture frames made into the holders for my bathroom and learn how to make them. Ty all! Love these ideas! I hope this helps. Thanks for visiting. You have some of the most innovative projects I’ve seen, from the Dollar Store. I love the way you think. Thanks so much for passing on your talent.